Wow!! 500,000 and still growing. I found this and many other poems on the Internet and I believe that this message says it all, far too many wonderful, beautiful animals continue to be neglected. 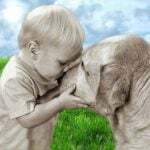 The priceless unconditional love that they have to give is cast aside; their need for companionship denied them, how can they possibly understand …they cannot. Please raise your voice for those who continue to suffer so greatly. But now the family hasn’t time.